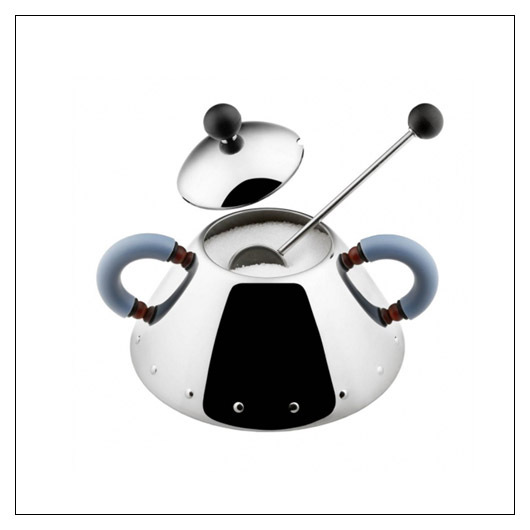 Alessi Michael Graves Sugar Bowl with Spoon (ALSUGARB) at Pure Design / Accessories / Home Entertainment ::: Furniture for the Home, Office, Home Office, and More at Pure Design Online! Sweeten up a table setting with the Alessi Michael Graves Sugar Bowl with Spoon. The distinctive stainless steel form, polyamide handles and knobs and glistening Mirror Polished finish make the Sugar Bowl with Spoon an easy to recognize member of the popular Kettle with Bird Whistle family.